It is a long and thankless path, requiring patience, concentration of mind and, most importantly, a strong desire to realize your potential. Such a crucial matter as implementing a large-scale project is much easier to cope with when you are working as part of a team. We believe that a successful project is the sum of ideas from different people. We are offering you a solution to your problems by using a combination of 2 applications, each one a powerful and convenient tool for creating and managing your projects. By using ConceptDraw PROJECT and ConceptDraw MINDMAP together you will be able to complete your work quickly and more efficiently. This is a successful combination of functionality, making it possible to consider and implement any project from the first spark of an idea to the first profits earned from your completed project. It provides you with quality support and increase the efficiency of your team project management processes. The possibility to create multi-projects and a shared resource pool. The necessary formats for reporting and documenting your projects. ConceptDraw MINDMAP is a powerful tool allowing you to document your ideas easily, as well as to sort and organize varied information represented in the form of visual maps. Use ConceptDraw MINDMAP to store and organize your ideas in the early stages of your project’s life-cycle. Thanks to the clear and visual representation of your ideas in the form of maps, schemes and task branches, you can review of your ideas resulting from brainstorming without overlooking the important details that might jeopardize the results of your work. Maps help you to display large amounts of information in a convenient form, and then organize and analyze it, saving you a lot of time. They also enable you to assign priorities to the project, and determine the number of people, resources and time required for both individual tasks and the project as a whole. Ideas already formed can be assigned a task status and the percentage of the task completed will be displayed as an icon. The completed map can then be easily exported to ConceptDraw Project. ConceptDraw PROJECT will make your ideas clearer and more accurate, and help you establish the relationships between the actions required to complete your project, so you can manage your project resources and tasks quickly and easily. It will help you monitor the progress of your tasks, control your resources and finances, and create reports reflecting the current state of your project. It is a powerful and handy tool for managers, letting them control all the necessary data in a project, create a hierarchical structure of available resources, and keep track of the changes and implementation stages of the project’s objectives. Thanks to clear formulation and the correct definition of problems (ConceptDraw MINDMAP ) plus automation of project management and adaptation of project tasks to specific objectives (ConceptDraw PROJECT ) you can increase the efficiency of your work and achieve success in your business. This combination caters to the needs of both individual users and people working in a team. In the Brainstorming mode you can create lists of work to do when planning projects, analyze potential problems and find non-standard solutions. It offers additional advantages for team-work, allowing for group discussion of problems and tasks, identifying whether the methods are appropriate for the goals of the project, and finding the most efficient means and strategies for task solving and implementation. The results can be uploaded to your corporate site for review and future amendments. In the Mind Map mode the ideas are represented as a visual scheme, aiding the perception and transfer of information. Periodic monitoring and group discussion will help you keep track of the stages of your project’s development. Having identified the key factors in advance, you will be able to evaluate the success of the programs being implemented and make necessary changes. Brainstorming provides you with an excellent opportunity to choose a solution from a large number of suggested variants rather than the opinion of a single person. This will help you reveal the hidden potential of the project and find numerous possible solutions to the assigned tasks. The combination of these applications gives you the most efficient tool for completing projects of any size, theme or objective successfully. Use ConceptDraw MINDMAP to brainstorm and compile your existing ideas. Use ConceptDraw PROJECT to manage project tasks and resources quickly and easily. It will help you monitor the progress of tasks, control resources and finances, and create reports reflecting the current state of your project. Generate ideas for your project yourself or as part of a group, create a task list and export it to ConceptDraw PROJECT Plan and monitor numerous projects, create reports, distribute resources from the shared resource pool and coordinate the work of multiple work-groups. All managers will benefit from using ConceptDraw PROJECT and ConceptDraw MINDMAP together. ConceptDraw MINDMAP allows managers to analyze the accumulated information and transform it into a form convenient for presentations and coordinating the work of subdivisions. ConceptDraw MINDMAP will help you find solutions to your problems and make the most appropriate decisions for your current situation. The program lets you classify accumulated ideas and put them together to get a general overview before making a decision. So the ideas of both the manager and the team don’t remain mere ideas, they become a tool working for the benefit of the project, making it possible to identify the primary and secondary goals and tasks, work out a work schedule and distribute the work between members of your team (having first evaluated their abilities, ideas and areas they need to work on). It helps manager draw their own ideas together with the ideas of the team into a single whole in order to create a work schedule and assign project objectives and tasks. For the next stage, all the material created in ConceptDraw MINDMAP is transferred to ConceptDraw PROJECT This means that the ideas will be represented in the form of tasks with resources, deadlines, order and relationships. You will be able to control the available finances, resources, completion speed and stages, as well as create flexible reports. 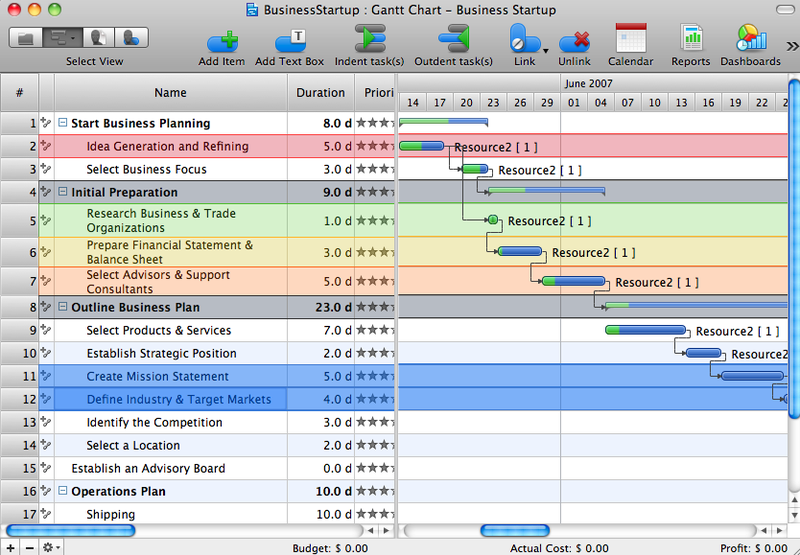 Another useful ability of the software is the creation of multi-project maps. A multi-page mind map created in ConceptDraw MINDMAP, once exported to ConceptDraw PROJECT, gets transformed into a ready-made system of projects and sub-projects, convenient for further management and implementation. Having a clear view of the processes underway, it is easy to keep all the changes under control and take the necessary steps in time. With these tools we believe you will be able to make top-quality project management an easy, convenient and cost-efficient affair. So, as a manager you get two tools allowing you to create the basic outline and concept for your project, while being able to directly supervise the project throughout all of the stages leading up to its successful completion. Enterprise collaboration software helps to facilitate action-oriented teams working together over geographic distances by providing tools that aids on communication, collaboration process and problem solving.